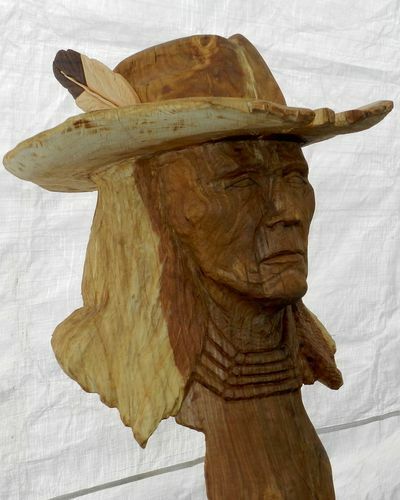 This carving is out of some elm. I had tried for a month to try and get this stump to quit splitting. I left it sitting in my truck unfinished at a sale! I was ready to turn it into something else. Three different Native Americans walked up and liked our art. They invited Terri and me to a upcoming Powwow. They said it would be great and that they all liked the Indian with the cowboy hat that I had in the truck. Well that gave me the motivation to work on this piece again. I was so busy trying to save the stump, I missed the Indian waiting to be released! Terri made me a feather to sick in his hat. Every piece you cut is more beautiful than the one before. Very, very nicely done! Any chance of you posting another picture showing the feather your wife made? Thanks Monty. The feather is maple and walnut Hillbillyshooter. Another wonderfully portrayed character piece Michael. The hat brim must have been a real challenge in end grain, checking stump wood. I really love that piece, Well done!!! -- Trev's Lakeland carvings - When the knife slips where will it go? Thanks Paul and the hat brim wanted to separate allot but then I have had brims in allot worse condition than this! Thanks mungletroll and Welcome to lumberjocks!!!!! A nice piece of work Michael !!!! beautiful work. Your carving is amazing. Thank you Harry and Peter! So love your work ! Very talented Very skillfull Be Proud.. Thanks David glad you liked it. Thanks Hybridwoodwork. When you technical carve you have that option of trying to start in the most predictable part of the round. If you read grain and follow images your pretty much stuck to where the image decides to show itself. Then like you said all you can do is try to work any cracks into and try to control the internal stress. I carve images already in plain site. Sometimes there are many images and than you might get to start in a more favorable area. Some pieces can be a handful. If so I bench them for a day or two. Eventually I will give them another go! Thanks again Hybridwoodwork. I like your thumbnail picture. Is that a mask? It’s hard to see the side. Michael, I like that job.